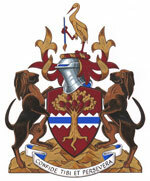 The oak tree refers to His Honour’s surname, Duchesne, meaning “of the oak.” The three visible roots represent His Honour’s three children with his wife, Ginette Lamoureux. The seven acorns represent not only their grandchildren, but also all of their future descendants. The horizontal band, clear and unbroken, symbolizes the law (as a notary) and His Honour’s work on parliamentary procedure and administration. It represents his path in life and his long career serving the public and parliamentarians. This blue band also refers to the sea and His Honour’s life near the water. The mirrored indented lines represent the mountains of Charlevoix, visible from L’Isle-aux-Grues. The crane (grue in French) symbolizes L’Isle-aux-Grues, Quebec, a place frequented by His Honour and his family for many years and of which he is particularly fond. 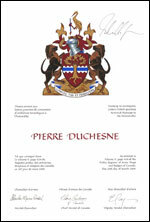 This reference to Quebec, also seen in the subtle form of the mantling ending in fleurs-de-lis, recalls His Honour’s attachment to Quebec and his career with the National Assembly of Québec. The paintbrush held by the crane represents His Honour’s interest in the arts. For His Honour, dogs represent two important values: loyalty and sociability. Bloodhounds are hunting dogs, tracking dogs and family dogs. The bloodhound is renowned for its endurance and exceptional sense of smell, which allow it to follow a trail easily over long distances and uneven terrain. Strongly attached to its master, it gets along well with its kennel mates and other domestic animals. For all of these reasons, His Honour admires these animals. As supporters, they stand on rocky terrain, reminiscent of His Honour’s native Charlevoix region. Meaning “Have confidence in yourself and persevere”. 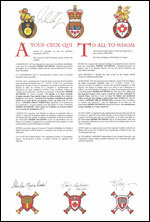 The announcement of the Letters Patent was made on December 12, 2009, in Volume 143, page 3681 of the Canada Gazette. Original concept of Claire Boudreau, Chief Herald of Canada, assisted by the heralds of the Canadian Heraldic Authority.